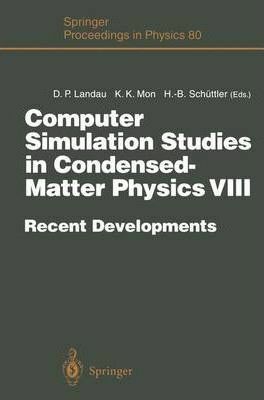 Computer Simulation Studies in Condensed-Matter Physics VIII covers recent developments in this field presented at the 1995 workshop, such as new algorithms, methods of analysis, and conceptual developments. This volume is composed of three parts. The first part contains invited papers that deal with simulational studies of classical systems. The second part is devoted to invited papers on quantum systems, including new results for strongly correlated electron and quantum spin models. The final part comprises contributed presentations. Illustrations note VIII, 181 p.
An Introduction.- I Classical Systems.- Modern Series Analysis Techniques and the Relation to Monte-Carlo Results on Similar Models.- Applications of Finite-Size-Scaling Techniques to the Simulation of Critical Fluids.- Growth and Etching of GaAs(001).- Monte-Carlo Simulations of Phase Transitions in Frustrated Antiferromagnets.- Simulation of Ionic Surfaces from an Absolutely Convergent Solution of the Madelung Problem.- II Quantum Systems.- Parallel Molecular-Dynamics Simulations of Amorphous Materials.- Monte-Carlo Calculation of Quantum J1 - J2 Model on the Square Lattice.- Evaluation of Dynamical Spectra for T = 0 Quantum Monte-Carlo Simulations: Hubbard Lattices and Continuous Systems.- III Contributed Papers.- Non-frustrated Ferromagnetic Ising Model on the Quasiperiodic Octagonal Tiling: Finite-Size Behaviour.- A Monte-Carlo Calculation of the Renormalized Coupling Constant for the Three Dimensional Ising Model Using Improved Estimators.- Molecular Dynamics Computer Simulation of Cooling Rate Effects in a Lennard-Jones Glass.- Coadsorption of Copper and Sulfate on Au(111) Electrodes: Monte-Carlo Simulation of a Lattice-Gas Model.- Phase Transitions in Multicomponent Widom-Rowlinson Models.- Localization Transition in Quantum Percolation.- Vortex Motion in the Two-Dimensional Heisenberg Easy Plane Model.- Thoughts on Interactive Simulation.- First Versus Second Order Phase Transitions in the Three-Dimensional Three-State Potts Model in Random Fields.- Detailed Balance Method of Chemical Potential Determination.- Monte-Carlo Simulation of the Casimir Effect in Critical Strips.- New Scheme of Hybrid Exponential Product Formulas with Applications to Quantum Monte-Carlo Simulations.- Spin Dynamics Calculations in the Two-Dimensional Classical XY-Model.- Index of Contributors.